Roger Vivier: Process to Perfection focused on the designer who was renowned for the bejewelled and elegantly sculptural shoes that he created throughout his life. Many of his innovations, such as the needle, choc and comma heels are as important in fashion today as when he first introduced them. Vivier’s career was established in the 1950s when he became the shoe designer for Christian Dior. During his time with Dior his shoes were the epitome of mid-century glamour and Vivier’s early training in scuplture at École des Beaux Arts is evident in the sculptural heels and toes he designed for Dior. After Dior’s death, Vivier continued to produce elegant footwear for the House of Dior but in 1963 he set out on his own. Among his many successes include the pilgrim buckle shoe popularized by Catherine Deneuve, which sold in the thousands, the thigh high boot popularized by Bridget Bardot and the reintroduction of the platform shoe. Throughout his career, Vivier proved to be extremely responsive to cultural shifts and he remained devoted exploring the artistic potential of shoe design. Ever engaged in designing shoes, Vivier worked right up until his death in 1998 at the age of 90. Throughout his illustrious career Vivier ceaselessly sought to refine his process and continually strove for perfection. 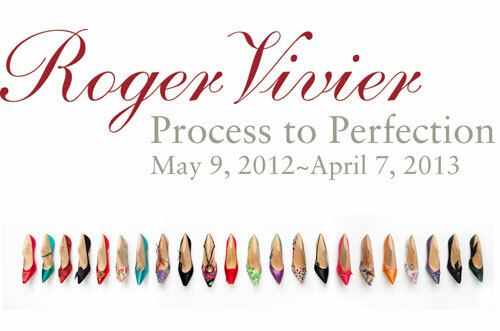 The focus of Roger Vivier: Process to Perfection was on the working process of Vivier and his masterpieces of shoe design. 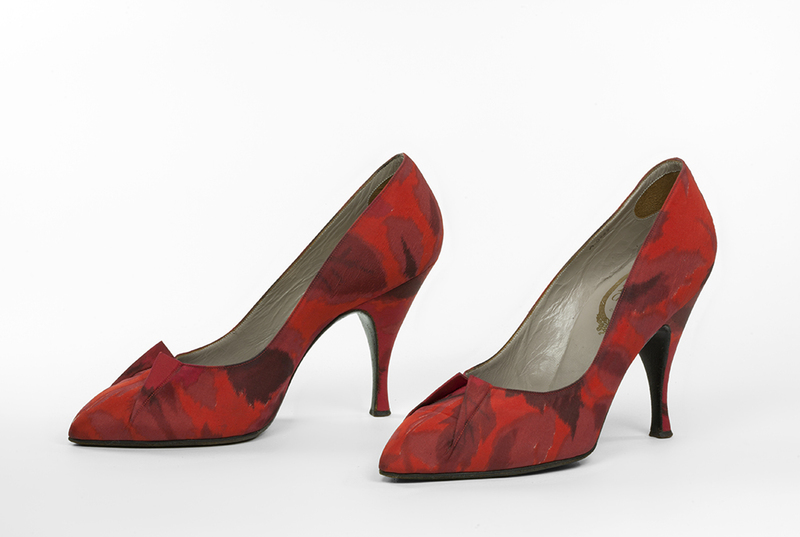 The Bata Shoe Museum’s Vivier holdings were complemented by loans from world-renowned institutions such as the Metropolitan Museum of Art in New York, the Deutsch Ledermuseum in Germany and the Roger Vivier brand. Visitors to the exhibition saw never before exhibited drawings by Vivier and pull-overs designed for Christian Dior which illuminate his working process. Visitors also enjoyed the jewels of his oeuvre—-the shoes that his working process wrought into perfection. Roger Vivier for Delman - Christian Dior, French, 1954. Printed silk taffeta. Worn by Oscar winner Ruth Gordon. Collection of the Bata Shoe Museum. Information: Christian Dior found in Roger Vivier a designer sympathetic to his interest in tailoring and the architecture of fashion. The synergy between the two designers can be seen by looking at their creations from the early years of the 1950s. Specifically, the “tailoring” of Vivier’s shoes and Dior’s dress make for compelling comparisons. 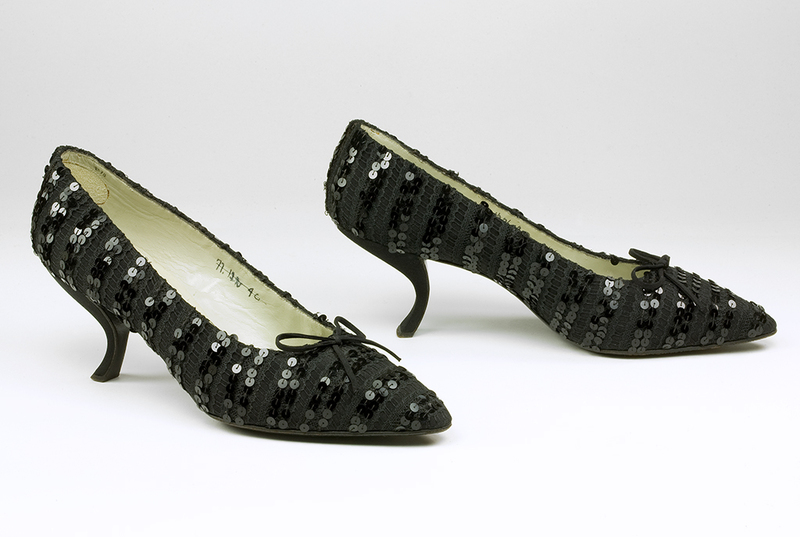 This pair of shoes, designed by Vivier for Christian Dior, features a reversed dart detail as the shoes only ornamentation. Black silk faille, black lace, black paillettes. This pair of shoes was made by Roger Vivier in 1963, the year he opened his own shoe salon after a decade of designing exclusively for Christian Dior. With its dramatic ornamentation of shimmering sequins and sculpted ‘comma’ heel, it is a classic example of the balance between embellishment and innovative structure which made Vivier’s designs some of the most desired treasures of the 20th century. Pullover designed by Roger Vivier, French, 1959. Turquoise silk satin, purple silk satin, wood. Vivier worked out the details of his designs on the pullovers he made. Pullovers are shoe uppers that have been pulled onto and over wooden lasts to show the design of a new style. The Bata Shoe Museum collection holds eighty pullovers by Vivier from his time with the House of Dior. It is telling to compare the pullovers to the shoes that were put into production. 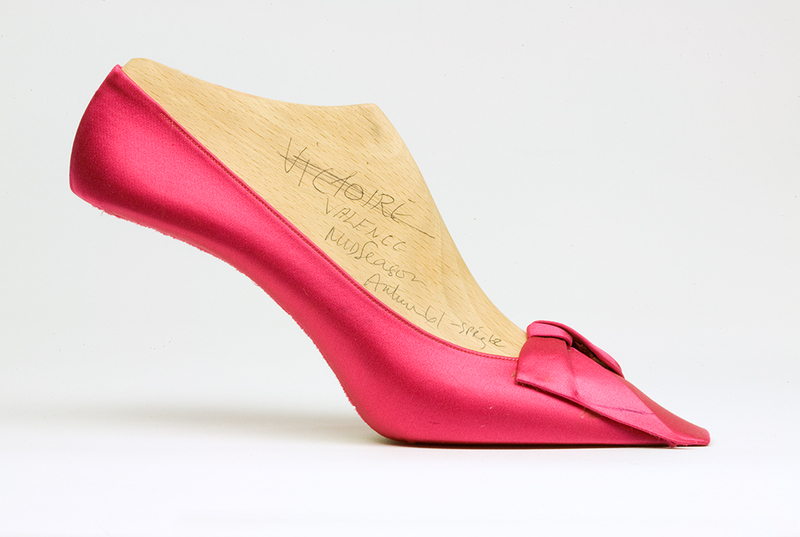 Many of Vivier’s more extreme refinements such as crisply squared or sharply angled toes were later modified in production. Vivier’s early training in sculpture at l’Ecole des Beaux Arts found expression in the way that he sculpted the last, shaped the arch of the heel and angled the tip of the toe. Throughout the 1960s Roger Vivier designed variations of his famous buckle shoe making versions for both day and evening. 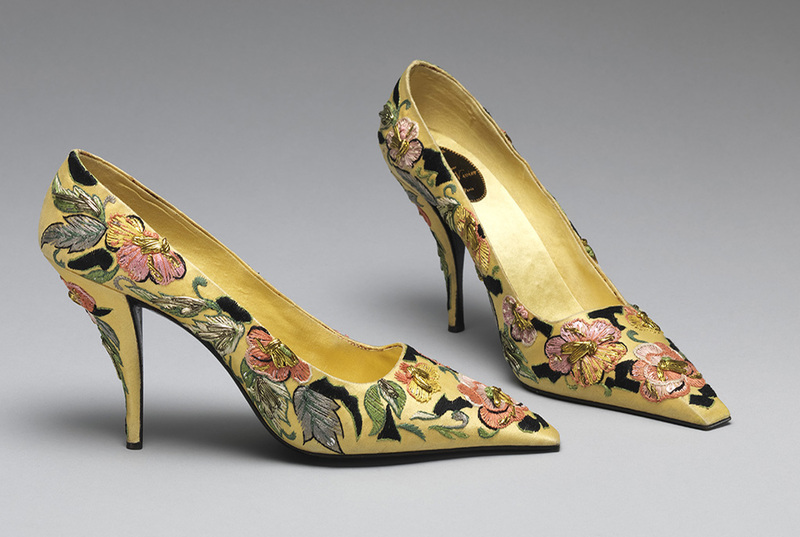 The ornamentation on this pair of shoes is limited to the scattering of coloured rhinestones on the gold buckle but its psychedelic fabric engages the eye. 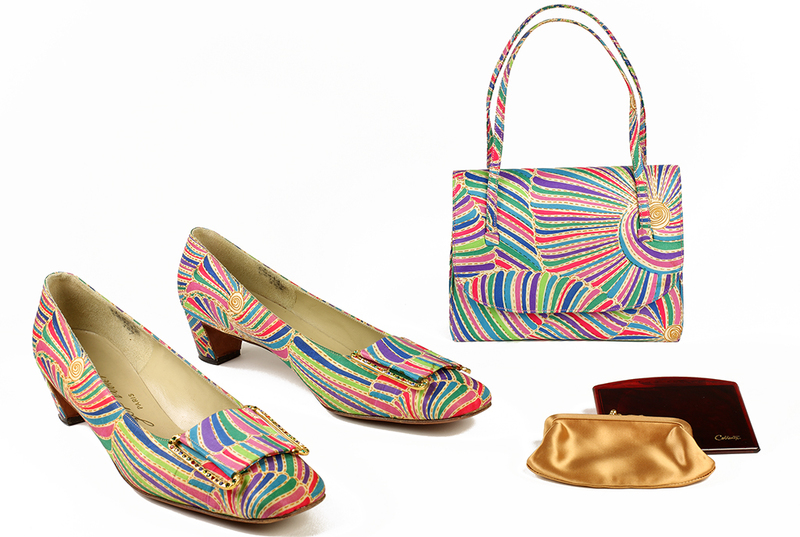 These shoes came with a matching handbag that was part of Vivier’s new line of purses which he began to offer in 1964. 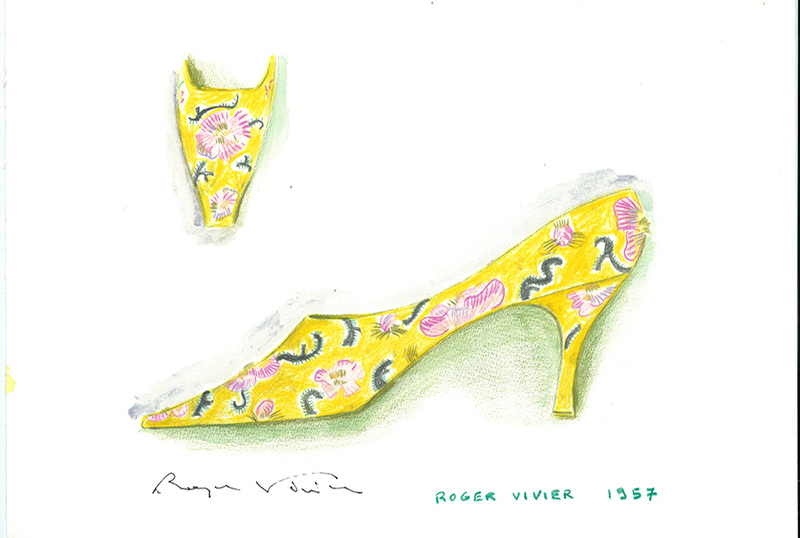 Roger Vivier drawing of yellow silk embroidered shoe, French, 1957. Pencil and ink on paper. Along with Dior, Vivier worked with master embroiderer Rébé to realise some of his most ornate designs. A pair of yellow silk shoes now held in the Metropolitan Museum of Art collection illustrates the collaboration between Rébé and Vivier. A sketch by Vivier in the Bata Shoe Museum collection of this same pair of shoes shows his attention to the decorative aspects of his design.